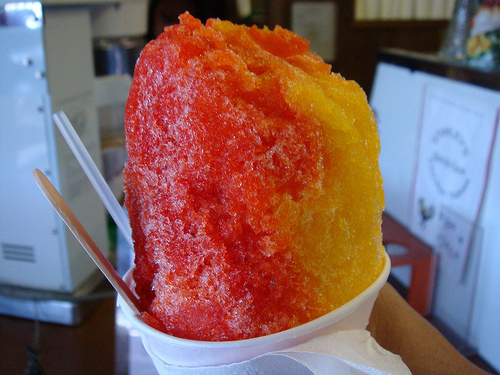 Shave Ice: So much more than a snow cone. 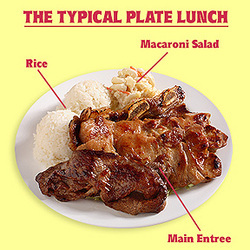 Plate Lunch: Meat. Rice. Macaroni salad? Poke: Raw fish right out of the ocean. Drool. 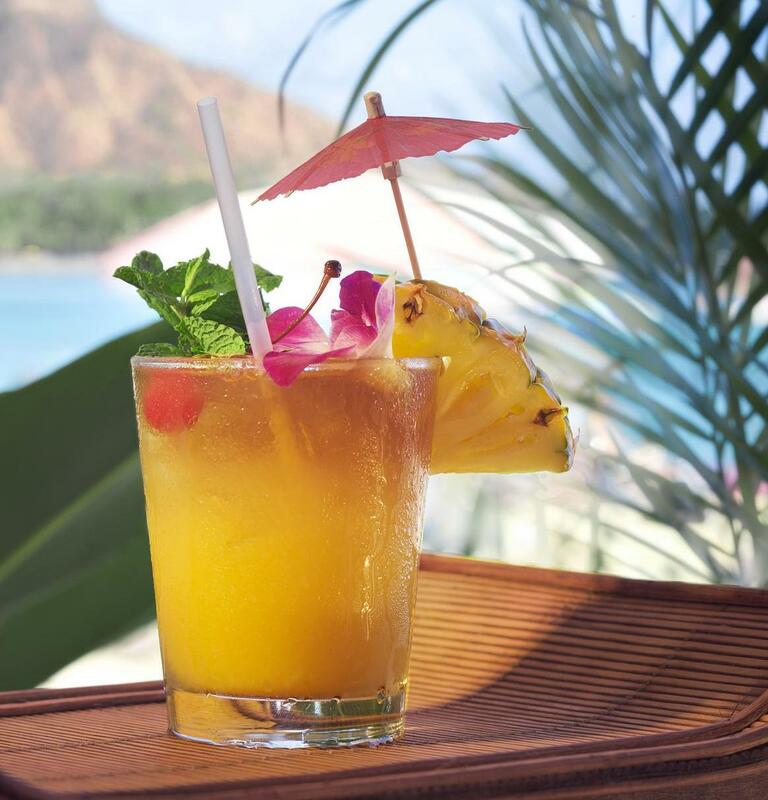 Mai Tai: Uh, not really Hawaiian, but I’ll be enjoying a few anyway. If I end up having internet access, I’ll probably post some pictures during the week. There will be some hiking, beaching, eating, and luau-ing. Maui, here I come. I ran across this soup on Je Mange la Ville and ended up making it just a few days after she posted it, it looked so good. I had half the ingredients on hand anyway. I stuck to the recipe pretty closely but did not make the goat cheese croûtons. While they looked good, I eat plenty of cheese as it is. In a big pot, saute the leeks in a little oil for about 3 minutes. Add the garlic for another minute before adding the carrots and celery for another 3-4 minutes. Next, add the broth and bring to a boil. Reduce heat and simmer. Season with salt/pepper and then add the green beans, zucchini, and tomato and continue simmering for 15-20 minutes. To make the pistou, add all ingredients except the oil into a food processor. Begin processing and then slowly add the oil until it’s a nice smooth consistency. 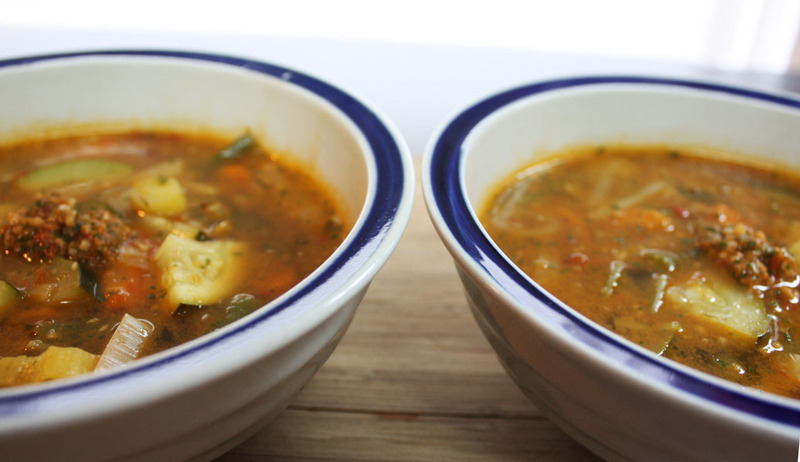 Set aside a bowl of pistou to add to the individual bowls of soup at the end. 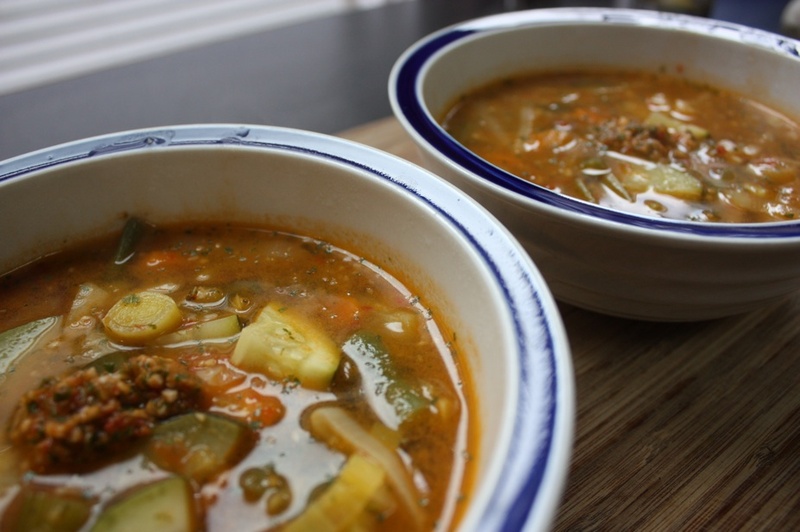 Once the vegetables are all cooked through in the soup, add the pistou into the pot and serve with a little extra on top. Notes: This was such a nicely flavored soup, with the garlic and basil and parmesan cheese adding a lot. Yum. This meal was tasty and healthy and I wish I was eating it again right now. 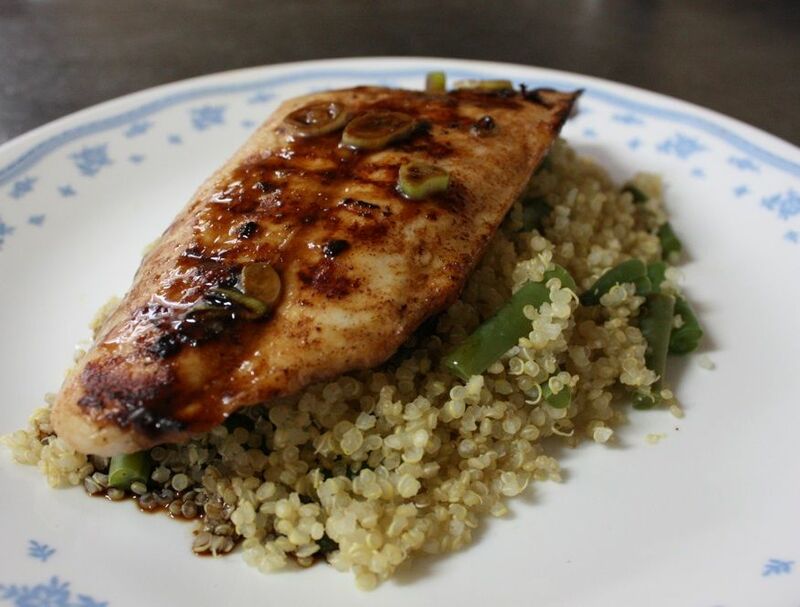 I adapted this recipe from Kalyn’s Kitchen and used the fish I had on hand and served with a bed of quinoa and green beans. Chris really enjoyed this recipe as well. In a flat dish or plastic bag, marinate the fish in half the sauce for about 15 minutes. Heat a grill pan to around medium and spray with oil. Grill fish for 2-3 minutes per side (this is a short cook time for the thinner fish I used, cook longer if using something thicker, obviously). Serve warm with extra sauce (not the used marinade) on top of quinoa and green beans, which I cooked in the same pot, by the way. Notes: Yum. I will make this again once I get more Trader Joe’s fish. Also, after the fish was done I threw on several whole green onions and grilled with a little of the marinade until nice and crispy on the outside. It’s not in the picture, but I served these with the fish and they were a great addition. First off, let me start by saying while this syrup contain seems like a good container for dressing, it’s not. 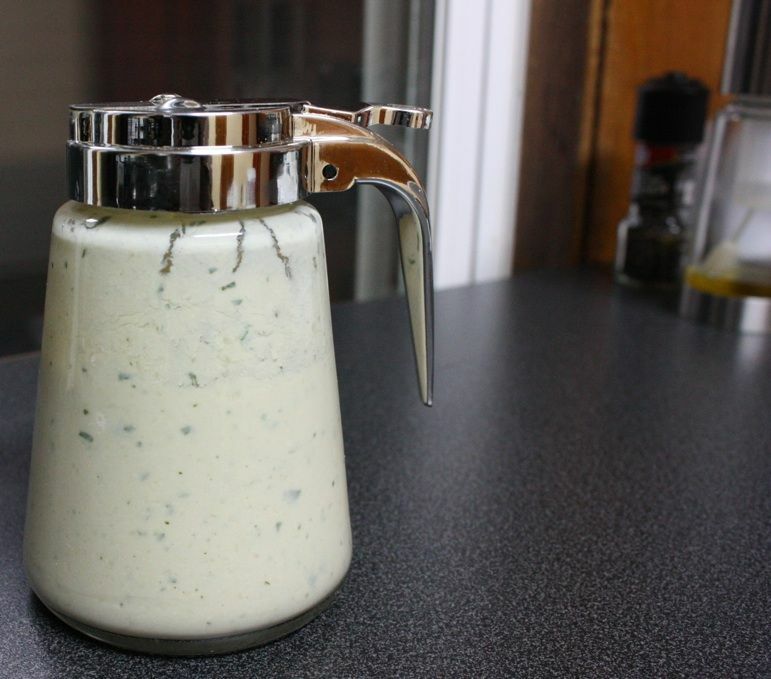 But on the bright side, once I use up this dressing, I’ll have a lovely syrup dispenser! This dressing is from Fat Free Vegan Kitchen and is her “Annie’s Goddess Dressing” wannabe. I’ve been enjoying it all week. Toss all ingredients into a food processor or blender and process until nice and smooth. Enjoy on your favorite salad! Notes: I really enjoyed this dressing and it’s a nice alternative to the high fructose laden, high fat dressing from the grocery store. So far, I think my favorite thing about my grill pan is making the grill marks on my food. Talk about a fun time! Anyway, I grilled vegetables. And they got grill marks. And I was happy. Rinse and dry zucchini and then slice. 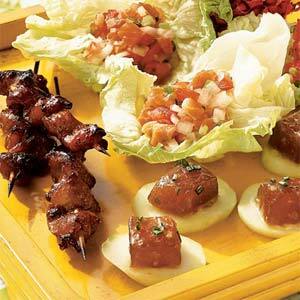 Marinade in italian dressing for a while before grilling. Tasty! Peel the sweet potato and slice. Either par boil or (*gasp*) microwave in a bowl with a little water for 2-3 minutes. This will cook the potato so you just have to get a nice crisp outside when grilling. Dry and spray with oil. Sprinkle with cumin, salt and pepper. Heat the grill and spray with oil. 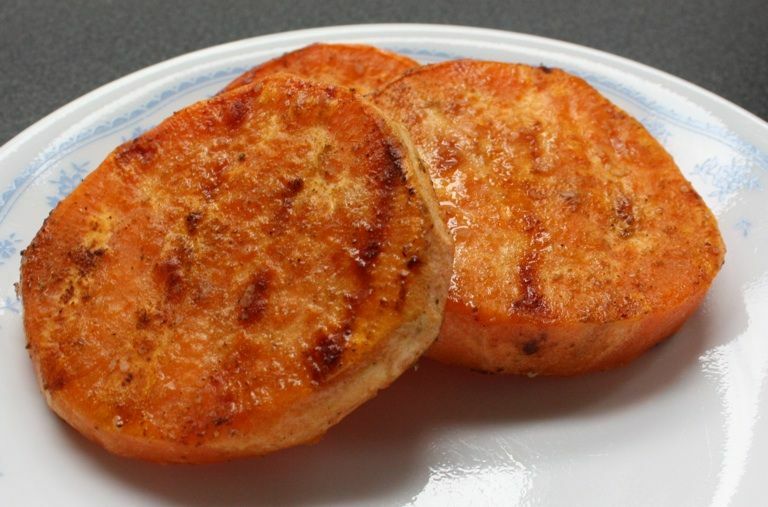 Grill zucchini and sweet potato until you get nice grill marks. Flip and repeat. Eat. Notes: I’m sure the zucchini would benefit from a little grated parm, but I’m going to Hawaii in two weeks. I don’t need extra cheese. This dish made for a nice healthy dinner. As you’ll see in the next few posts, I’ve been using my grill pan a lot lately. 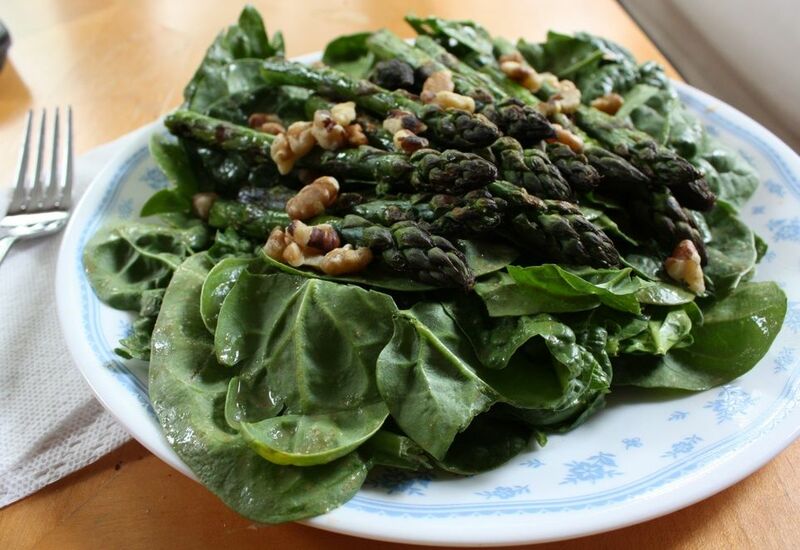 I love grilled asparagus and the dressing combination with the spinach made for a very tasty and filling main dish for me. Thanks Fat Free Vegan Kitchen. Clean asparagus and spinach and get the asparagus grilling on the grill pan. 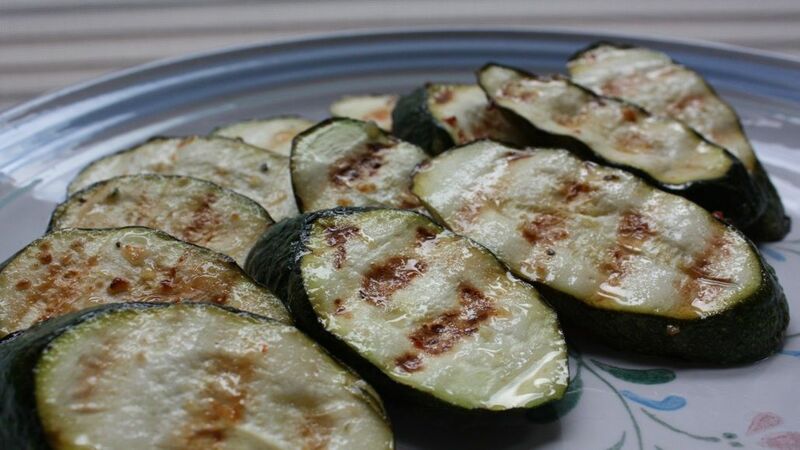 Spray a little olive oil on the pan first and then grill on medium heat for 5 to 8 minutes. While grilling, make the dressing. I put all the ingredients into a small container with a lid and shook it to mix. In a big bowl, toss the spinach with a bit of dressing and plate. Top with grilled and seasoned (salt/pepper) asparagus and a handful of walnuts. Enjoy. Notes: You will have left over asparagus, which is great in eggs in the morning or on other salads. I love cauliflower. It’s so versatile. I’ve seen a few recipes around for roasted cauliflower, roasted to the point of being caramelized. Slice cauliflower into 1/4 inch slices. Some will crumble but you should get several large sections. 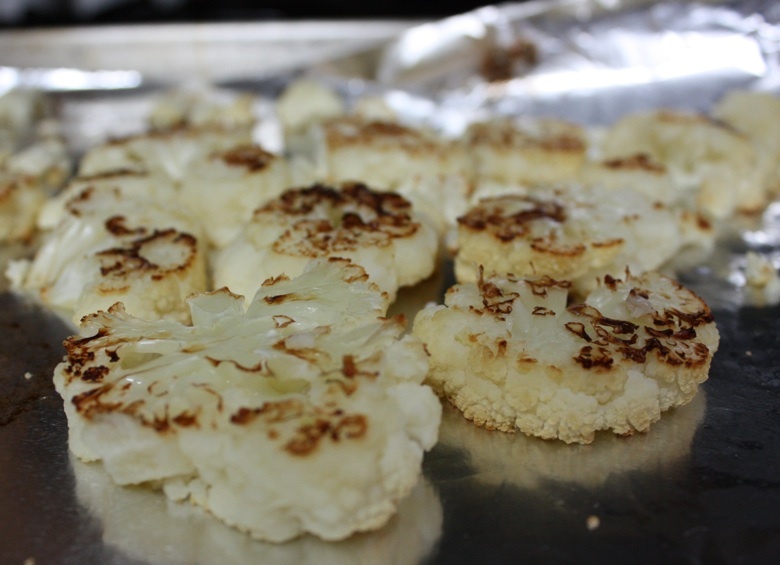 Spray a cookie sheet with oil and spray cauliflower with oil. Bake at 400 degrees for 30 plus minutes, flipping cauliflower at least once. Salt and pepper and enjoy.